Canadians fret that Americans never pay attention to Canada – but then get really worried when they do! If this anecdote is true, then the Association for Canadian Studies in the United States (ACSUS) might get some toques in a knot north of the 49th parallel (and due to my persistent cultural edifications efforts over the last year, a few more Americans now know what a toque is). There a number of established Canadian Studies programs in the US, such as at Maine, Western Washington, Bridgewater State, or St. Lawrence University, and there are a number of Canadian scholars (and scholars of Canada) working at American universities, their numbers boosted by the recent exodus of Canadian environmental historians to the United States. However, it should be pointed out that one doesn’t need to be located in the US to join ACSUS, and it sometimes meets in Canada. My own university has a somewhat dormant Canadian Studies program – though I hope to help revive it – a process exacerbated by the Canadian government’s cancellation of the “Understanding Canada” program a few years back. This cut removed one of the main funding sources for Canadian Studies programs in the United States (anecdotally, I heard that this funding did often come with strings attached, such as a stress on activities that trumpeted natural resource extraction and trade expansion between the two countries). The 2015 edition of the biennial ACSUS conference took place in Las Vegas. Despite the slogan that what happens in Vegas, stays in Vegas, I’m going to do the opposite. The conference started out on a high note because of the Blue Jays dramatic Game 5 victory over Texas, punctuated by the Jose Bautista homer and “bat flip.” Memories of my early teen years are defined by Roberto Alomar – I still have his jersey hanging in my office – and the back-to-back World Series championships (I’m not sure that the rest of Canada is aware that my hometown, Saskatoon, rioted after the Joe Carter walk-off home run). The Jays series victory led to some interesting discussions at ACSUS about the importance in Canadian culture of baseball, the Blue Jays, and the ’92 and ’93 championships (an importance perhaps revealed by the backlash against announcer Harold Reynold’s statement that Canadians can’t catch foul balls). A panel titled “Environmental Governance Across Borders” featuring Carolyn Johns, Andrea Olive, Peter Thompson, and Martin Heintzelman, as well as a paper on borderland railways by Randy Widdis, had elements that would appeal to environmental historians/historical geographers. As is often the case at conferences, some papers or panels that I thought looked interesting were scheduled at the same time or I was unable to attend (in addition to using conference time for meetings, I joined some others to play hookey for Game 1 of the Blue Jays-Royals series) and the titles of some of the presentations I missed, such as those by David Massell and and Matthew Wiseman, suggested they had an environmental dimension. Incidentally, this was my first time in in Las Vegas. The Sin City had never held that much attraction for me, though enough people kept telling me that one doesn’t need to engage in debauchery in order to enjoy Las Vegas – that between the spectacle of the strip, food, and shows, there is something to entertain everyone. Indeed, the scale and artificiality of this Disneyland for adults was a sight to behold. It is consumerism and materialism gone rampant, and is fascinating in a kind of disgusting way. Unsurprisingly, the environmental history of Las Vegas has already received attention from scholars (see, for example, Hal Rothman’s Neon Metropolis). As someone who studies water engineering and usage in the Great Lakes-St. Lawrence basin, I mostly research water abundance. But Nevada and the southwest is an area of water scarcity … though places like Las Vegas certainly give the illusion of water abundance, what with the flowing fountains and shark tanks. Something that I frequently address in my water courses are the replumbing of western rivers such as the Colorado, as well as schemes to divert water on massive scale to the arid areas of the US southwest, as well as the policies to prevent it. Thus, I was most excited about going to Las Vegas because it meant a chance to visit the Hoover Dam and Grand Canyon. Though there are many bus tours (as well as jeep, helicopter, and airplane), Josh MacFadyen, Peter Thompson, and I decided to rent a car and strike out on our own since the two of them had to be back in time for evening flights. 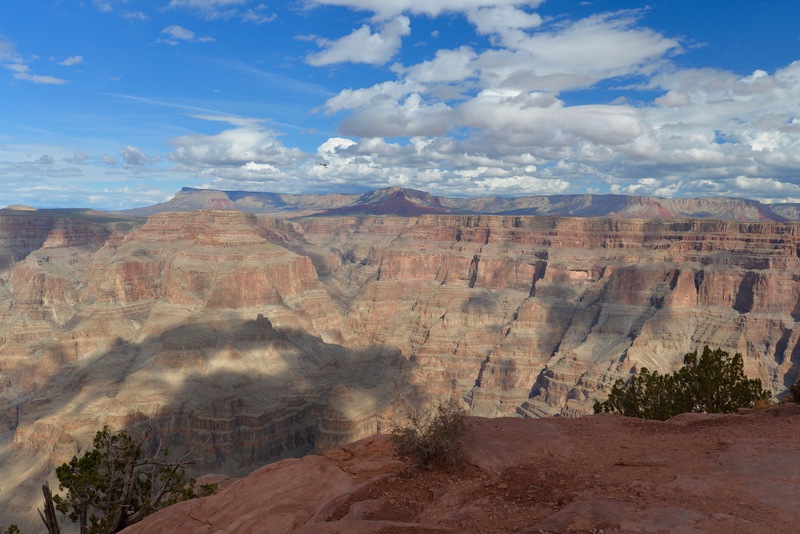 On Saturday morning, we drove for a few hours to get to the West Rim of the Grand Canyon, which is within and operated by the Hualapai Indian Reserve. We went straight to the two primary lookouts: Eagle Point and Guano Point. 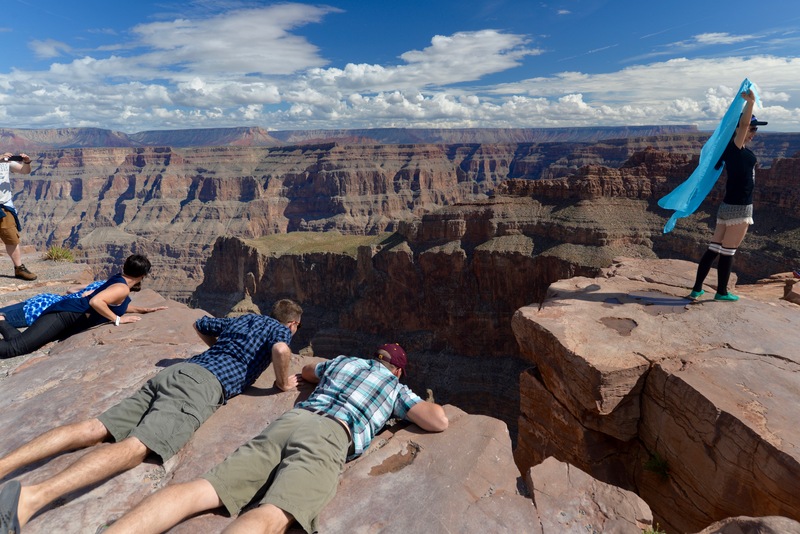 The first thing that struck us was how dangerous it was – there are no fences or safety precautions to stop eager tourists from toppling thousands of feet to their demise, and on average 12 people per year do perish in the Grand Canyon (though only a few fall from the top of the gorge). Of course, once we inched ourselves towards the edge, the other thing that struck us was how amazingly beautiful it was. My adjoining pictures fail to do it justice. 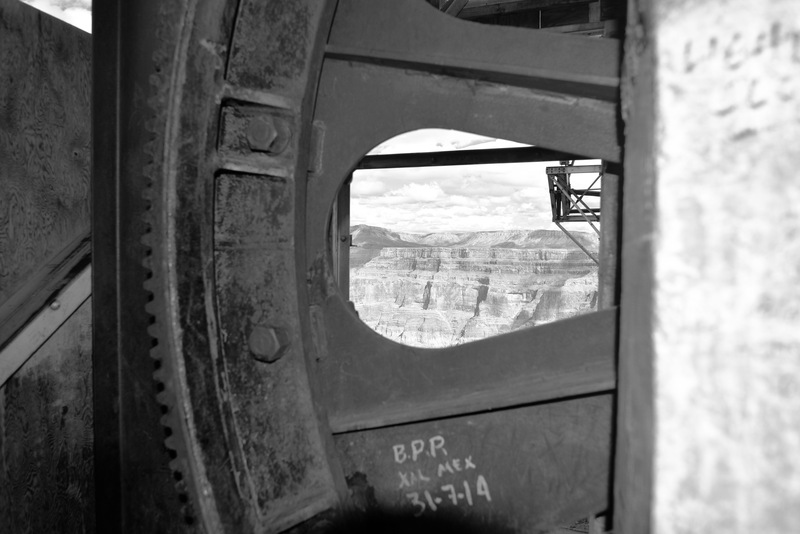 The Colorado River runs along the bottom of the canyon, but the tourist sections of the Grand Canyon were almost dammed in the mid-20th Century. 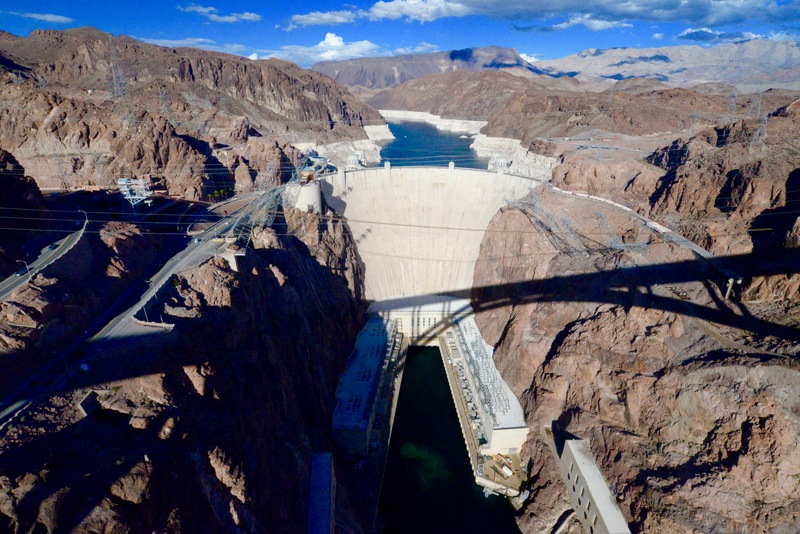 Las Vegas gets 90% of its water from Lake Mead, the reservoir on the Colorado River behind the Hoover Dam. It is the largest reservoir in the United States; at least, it is the largest when it is full. Oh, did I mention that it hit record lows this summer and is at 40% capacity? The white strip of rock above the waterline – like a bathtub ring – reveals just how much the reservoir has been drawn down. 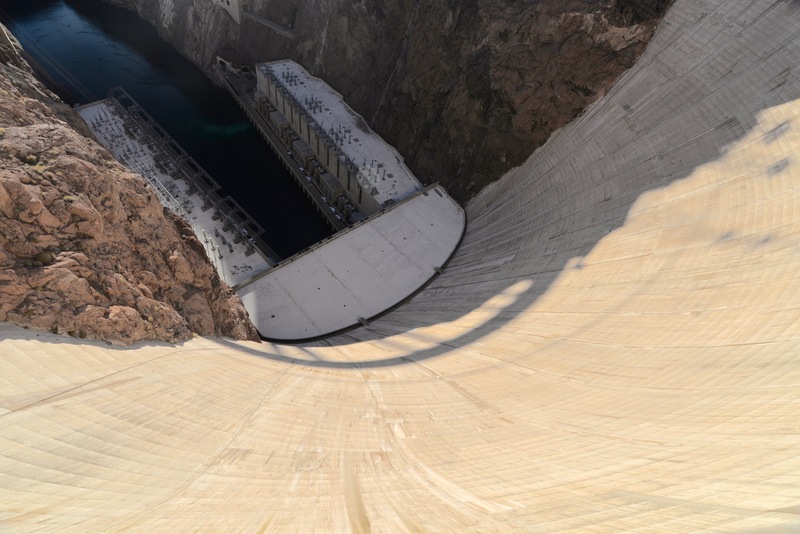 Despite knowing all that, Hoover Dam is still a sight to behold. Though I have toured a number of bigger generating stations, Hoover Dam is iconic because of its history, curving art deco design, and picturesque and dramatic setting. The experience was enhanced by the ability to see the dam from above via a bridge built in 2010 – an information installation relayed that until this bridge was built the highway wound its way down and up the gorge via the top of the dam – and to walk right on top of the dam (many other large North American dams were closed off to tourists after 9/11). 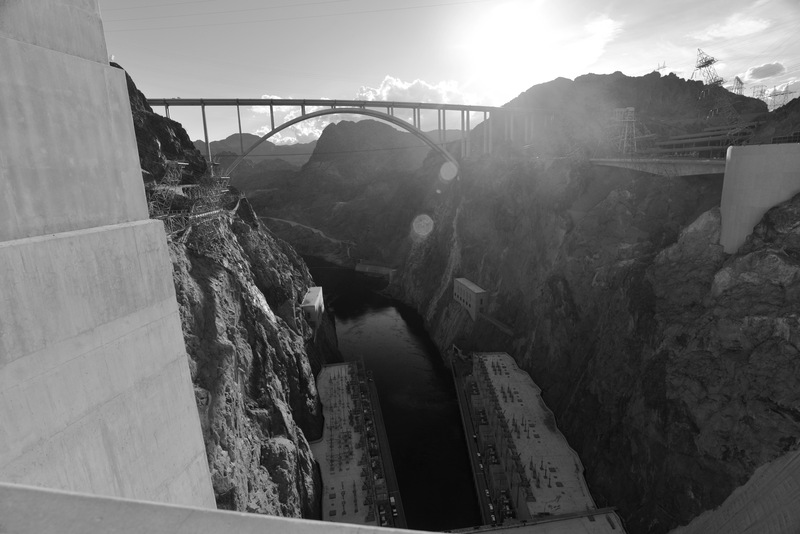 Hoover Dam from the O’Callaghan-Tillman Bridge. Notice the ring of white rock indicating the drawdown. Las Vegas shouldn’t be there, at least not on such a scale – there isn’t water to support that many people (granted, it is very efficient at using the water it does have). Same goes for much of the US southwest. California’s Central Valley shouldn’t be the prime produce-growing region of the United States. Cutting back on lawns and showers isn’t going to do anything to alleviate western drought – in part because of flawed “prior appropriation” water laws, the agricultural and irrigation industry uses some 90% of California’s water, much of which is diverted long distances (check out this map of the state’s water system). Making the desert bloom has been done on the back of rivers like the Colorado. When in 1922 its waters were divided up between the various states that siphon it off, levels were unusually high; as a result, the river was over allocated, meaning that legal rights exist to take more water than is present in the river (and to those living in the northeastern half of the continent, the Colorado isn’t even a particularly large river). Consequently, the Colorado River often runs dry before it debouches into the Gulf of Mexico. Especially when there is drought. Which of course there is now, and the frequency and intensity is only likely to get worse with climate change impacts. There are many ideas about how we can move water to people. But we should be thinking more about the reverse: moving people to the water.